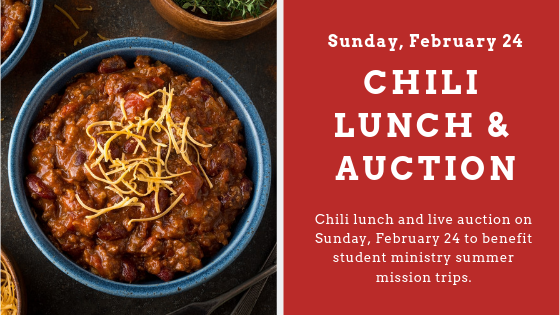 Join us on Sunday, February 24 for a chili lunch and auction following the 10:30 am service. The live auction and donation lunch will benefit student ministry summer mission trips. Items up for auction include Royals tickets, Sporting Kansas City tickets, dinner at Jim & Cathy Seals, an overnight at Tall Oaks and much more. There will also be a silent auction with lots of great items. Don’t miss this fun event to support our youth!